-Read the excerpt below from Joseph Rossell's post at Media Research on March 9. The “Big Three” networks have generally avoided identifying Venezuela as socialist. This is especially important since the Obama administration just declared the nation a “national security threat and ordered sanctions against seven officials,” according to Reuters. 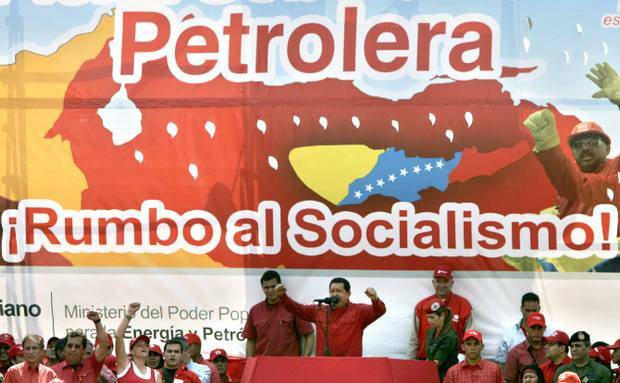 Venezuela’s leaders have clearly identified themselves as socialists. Late leftist president Hugo Chavez proclaimed, “We’re heading toward socialism, and nothing and no one can prevent it.” Chavez’s successor Nicolás Maduro was elected in April 2013 also committed himself to pursue “21st century socialism,” according to CNN. Yet the broadcast news networks failed to describe Maduro or the Venezuelan government as socialist or autocratic in more than 87 percent of stories (28 out of 32) about Venezuela’s economy or unrest. MRC Business looked at morning and evening news stories and news briefs between Jan. 1, 2014, and March 8, 2015. Not one of those reports clearly linked Maduro’s or Chavez’s policies to the problems faced by the country. Instead of producing prosperity, these policies have contributed to inflation, shortages and widespread violence. The Economist magazine identified Venezuela as “[p]robably the world’s worst-managed economy” on Sept. 20, 2014. In response to these shortcomings, “President Maduro’s government has faced ongoing protests and civil unrest since the beginning of 2014,” The New York Times said. “We are deeply concerned by the Venezuelan government’s efforts to escalate intimidation of its political opponents. Venezuela’s problems cannot be solved by criminalizing dissent,” said White House spokesman Josh Earnest according to Reuters. Clearly, the media were aware of the connection between authoritarian and socialist policies and the unrest in Venezuela. Network coverage failed to reflect it. Weekend host of ABS’s Good Morning America Ron Claiborne noted “protests against high crime, inflation and food shortages” on March 16, 2014. But he failed to explain why these problems had occurred. Although he labeled protesters as “anti-government,” he made no mention of Maduro’s political views. The networks’ failure to describe Maduro as a socialist and autocrat paralleled their coverage of Venezuela’s previous dictator, Hugo Chavez. The media had a history of overlooking Chavez’s left-wing politics in favor of a more sympathetic view. ABC News claimed in a story March 2007, that the anti-American dictator did in fact “like this country,” and also described Chavez as “passionate,” “dignified,” “intelligent” and a coffee lover. In recent coverage, the networks continued to ignore how both Maduro’s and Chavez’s socialist policies, including nationalization (the process of taking a private industry into public ownership by a national government or state) of the oil industry, had hurt Venezuela. Methodology: MRC Business examined news stories from morning and evening news shows on ABC, CBS, and NBC from January 1, 2014, through March 3, 2015 that mentioned Venezuela. Stories that only mentioned Venezuela only in passing were excluded. Of the 32 resulting stories and news briefs, only four mentioned described Maduro or the Venezuelan government was socialist or autocratic. None discussed the causes of the country’s problems in detail. 2. Why do you think the networks choose to skip informing viewers that Venezuela’s government is socialist?